Welcome to the Edina High School Choirs website. We hope that this site a useful resource for current students, parents, alumni, community members and prospective students. We will share with you a little history of our tradition of excellence and our current offerings as you explore the site. If you have suggestions as to how this site may be improved please contact one of the directors. 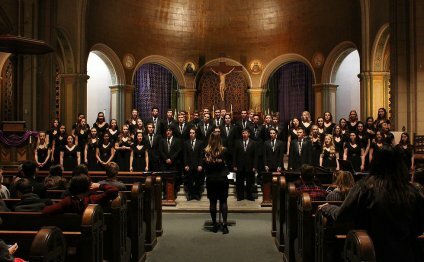 The Edina High School Choirs have been hitting the high notes since the opening of the first Edina High School in the fall of 1949. EHS choirs have consistently done well both at state competitions and national festivals garnering many awards. The choirs are part of a Music Department that received the Minnesota Music Educators Association Exemplary Program Award in 1998, and received national recognition as a "GRAMMY Signature School" in 2005 & 2007 from the GRAMMY Foundation® and the Edina Public Schools Music Program received the NAMM Outstanding Communities for Music Award in 2012. There are many reasons for this success: supportive administration, good facilities and a fantastic elementary and middle school music program but what really makes the EHS choirs special are the fantastic, devoted students and their incredibly supportive parents. Edina Choir Boosters is now a 501(c)(3) organization. Please keep this in mind as you consider becoming a member. Watch for more information after school starts in August. The continued support from our Boosters has allowed us to offer scholarships for trips and attire as well as enhancing the program through large purchases like choir risers, acoustical shell and instruments.